31 Foot Cabo Express "Cabolero"
The Cabolero has been described as the most perfect 31-foot sportfishing boat ever built due to its many features: Speed, ability to turn on a dime, sleek lines, stability and thoughtful construction as well as an ideal fishing layout. The cockpit has a fighting chair, bait prep stations, two large fish boxes for storing your catch and plenty of shaded seating. The main cabin has a double bed, an "L"-shaped lounge that converts to a sleeping berth, built-in TV, DVD, ceramic cooktop, microwave, refrigerator and teak cabinets. The bathroom is roomy and comes with a shower. The tuna tower gives the captain an excellent vantage point from which to spot fish. Captain Guadalupe has over 15 years� experience in the local waters. 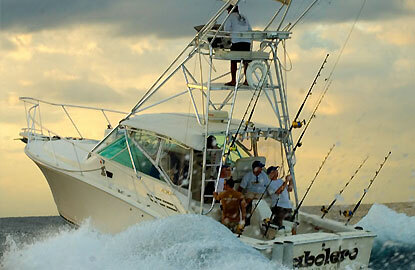 His largest fish to date is a 712-lb #069 marlin. He is a young captain with a lot of energy who loves to fish.